When it comes to choosing a diamond blade, it helps to know a bit about the various features of them. Why? Because each part of the diamond blade contributes to the way it performs. Which materials it cuts well and how long it lasts are only a couple of the performance measures. Does it cut straight? If you are a high production shop, then the speed of each cut has a direct bearing on your efficiency. And as we know, efficiency translates into profits. Knowing a little bit about diamond blades can help you choose the right blade for a given project. How Much Are Diamond Blades? What Are Diamond Blades Made Of? From those inquiries, it is obvious that the structure of a diamond blade is of interest to many. So, rather than answer each of those questions, we will simply discuss the various aspects of the tool and comment on how each aspect plays a role in the performance of a diamond blade. When considering which diamond blade to use for a given purpose, it is good to know the dynamics behind the blade’s performance. Getting familiar with the parts of a diamond blade are imperative. In fact, knowing how each aspect of a blade affects its cut, is key to choosing the right blade for the job. 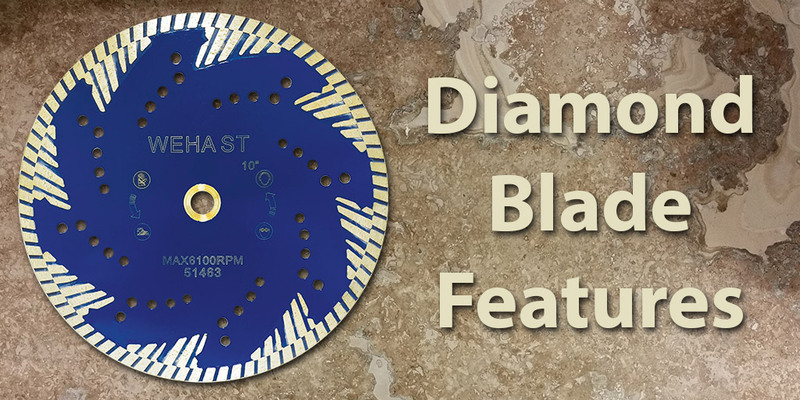 Let’s explore some key parts of a diamond blade talk about the importance of each. Each of the above cores offers specific benefits. A silent core diamond blade is designed to reduce the amount of noise and vibration that can be observed while using diamond blades that do not offer a silent core. Additionally, the reinforced core diamond blades are made in such a way that they are not easily warped and stay true through the cutting process. This yields a straight cut since the blade is resistant to warping. Each kind of edge brings a particular benefit; depending on what kind of material you are cutting. For example, continuous rim diamond blades cut materials such as porcelain, ceramic, and glass well. 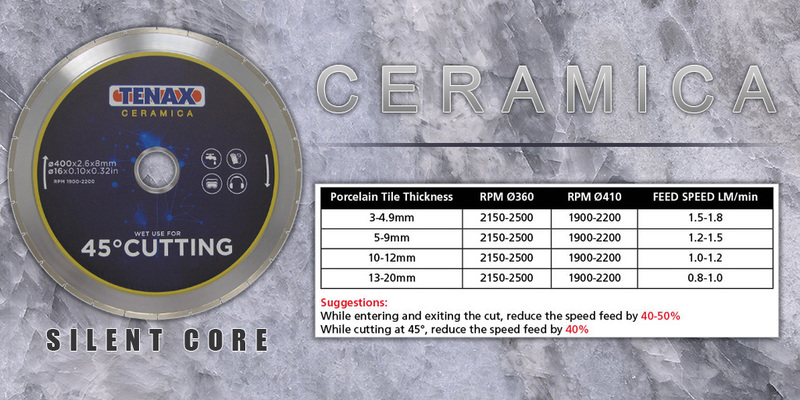 So if you are looking for a diamond blade for cutting porcelain, you may want to try one of those. Another feature of the edge that affects the performance is its thickness. As a result, you will see thin diamond blades and even ultra thin blades as you browse diamond tool inventories. When it comes to the edge of the blade, another aspect of the blade’s performance is the bond (or matrix) that hold the diamonds. The bond of a diamond blade is also referred to as the blade’s matrix. It is the material in which the diamonds are encased. This material is available in a variety of consistencies; some softer than others. You might be tempted to simply look for the hardest bond (matrix) available. However, that is not necessarily the best option. The rate at which the blade’s bond wears works together with the rate at which the diamonds fracture and break. As these two materials deteriorate, new diamonds are exposed. This process is how the blade stays “sharp”; continues cutting well. Hence, there are some stones that respond better to blades with a softer bond. The faster the bond wears, the quicker fresh diamonds are “released” for cutting. Use caution when handling diamond blades. Inspect the blade for shipping damage before using it. Run diamond blades at the speed marked on the blade. Ensure there is a continuous water flow on each side of the blade as it is running. Wear proper safety gear while using your diamond blades. Use the blade only on the material it was designed for. Regularly check the blade for signs of overheating, cracks or excessive wear under segments. Allow the blade to cut the material. Cut only straight lines unless the blade is designed for cutting curves. Run the blade above the speed marked on the blade. Use a diamond blade with an incompatible machine. Dry cut with a blade designed for wet cutting. Force the material into blade at a rate higher than the blade can cut. Use a diamond blade that has been dropped or overheated. Stand directly in front of a running machine. Use a diamond blade that does not meet the requirements of the machine manufacturer. Touch diamonds blades directly after stopping them. As we have discussed here, a diamond blade is designed for cutting certain types of materials. The core of the blade as well as the type of edge and the bond (or matrix) of the blade all contribute the way the blade cuts, how it responds, and the length of its life. Choosing a blade for a particular purpose requires a certain type of blade. There is not a one type works for everything approach. So the next time you are seeking a new blade for a specific purpose, check out some of the features the blade offers and select one that is designed for the material your are working with. If you do, you may see a boost in performance, productivity, and even profitability. That’s good to know that the speed a diamond blade should be used at is marked on the blade itself. My cousin is a sculptor and just got a huge chunk of marble he wants to work on, so I’m helping him find a blade to use. We’ll have to see which blades are best for marble and then I’ll have to tell him to look at the blade before he uses it to make sure he uses the correct speed. There are a number of blades that work well for marble. It just depends on what you are looking to do. For example, if you are cutting a marble slab with a bridge saw like one available from achilliusa.com, you will need a larger size blade. However, in other cases, you may need a different kind of blade.